I learned how to use a rice cooker at a young age thanks to my mother and two aunts. In fact, I was a teenager before I realized cooking rice on the stove was a thing! If you’re wondering how to use a rice cooker, keep reading for simple rice cooker instructions, plus a fool-proof tip for how to make white rice in a rice cooker perfect every time. First off, let’s clarify which type of rice cooker I’m talking about using. There are some fancy, schmancy (read: expensive) rice cookers out there that honestly I would expect to set the table and do the dishes too for the price tag. This Rival model has changed slightly over time but the basic design is the same. I’ve used my personal one for 15 years and couldn’t be happier with it. It’s the same style my mother has had for 25+ years. The first step is to rinse your rice in a colander until it’s no longer cloudy. This makes for some sticky, sticky rice if you are using the right kind. More about that later. How much water do you put in a rice cooker? 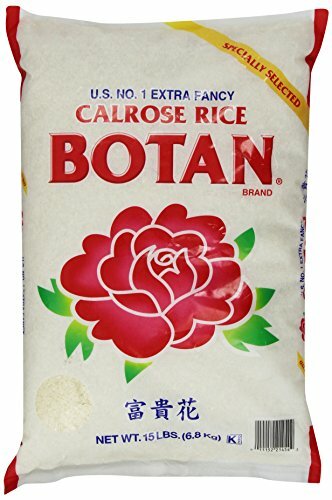 If you cook rice in a rice cooker and are confused about the rice to water ratio, here’s a fool-proof tip that I use every time I cook rice! Most rice cookers come with a measuring cup (which I have loooong since lost along with rice cooker instructions. After 15 years, it happens!) and measuring lines on the inside of the cooking bowl. To get perfect rice, add the amount of rice you would like, and shuffle the cooking pot around so that the rice is level. Then place the end of your finger at the top of the rice pile. 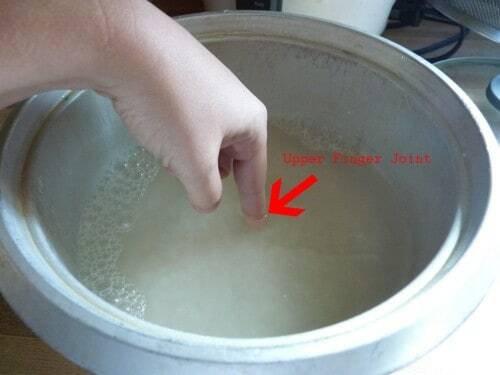 Your finger will just be touching the top of the rice. Don’t dig down! Now add water until it comes to the top knuckle of your finger. 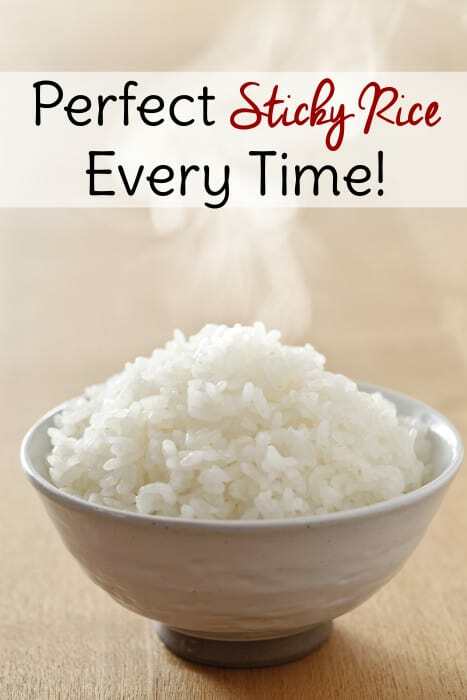 Your rice cooker rice will come out perfect every time no matter how much you are making! I love that I don’t have to keep up with the special measuring cup thanks to this cool tip for how to use a rice cooker. Place the lid on the rice cooker and depress the level down to the cook setting. Do not lift the lid until cooking is complete no matter how tempted you are. I can remember my mom and aunt taking this a step further and placing a couple of rolled up kitchen towels over the lid to really keep the steam in. I hesitate to recommend that just in case it’s some sort of safety hazard, but at the very least, don’t open that lid! Perfect rice cooker rice starts with using the right kind of rice. Make sure you use short grain “sticky” rice and not the typical brands found in big box stores or grocers. You’ll be amazed at the difference. Hubs always thought he didn’t care for rice very much unless it was jazzed up with butter and all sorts of seasonings. Then I schooled him on how to cook rice in a rice cooker and which kind of rice to use. Now eating it plain is one of his favorite side dishes! This is the brand I use in case you’re wondering. 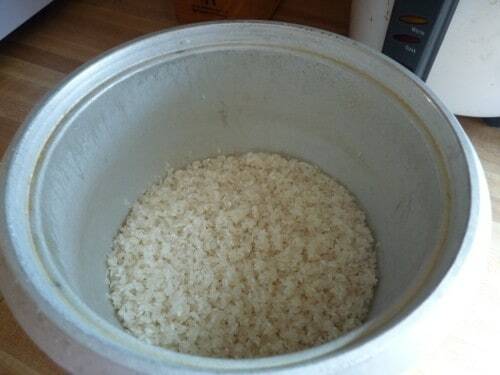 Now that you know how to cook rice in a rice cooker, why not make a big batch and save some of the leftovers? 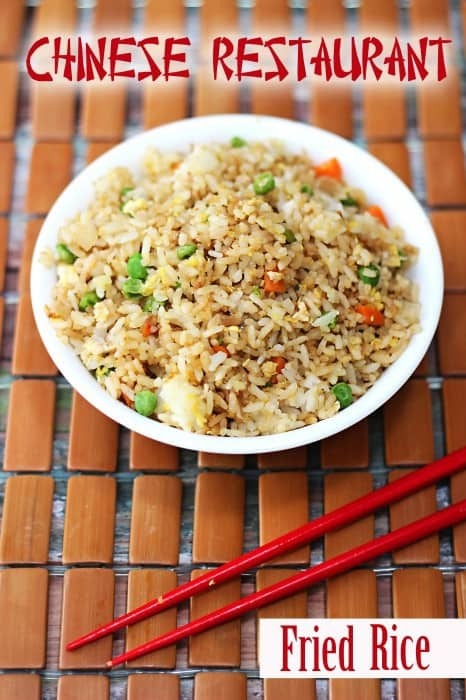 Second day rice that has been refrigerated is ideal for making the perfect restaurant-style fried rice.